Tanzania coffee tends to be medium in body and is very soft and very clean in the cup. If you're looking for a change, Tanzanian coffee is a rich and mellow treat. 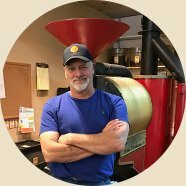 WHAT DOES OUR GREEN COFFEE IMPORTER SAY? Tanzanian coffees are grown on the slopes of Mount Kilimanjaro, under the shade of banana trees, truly an exotic location for this east African coffee. This coffee is somewhat similar to the coffee of its neighbor north of the border (Kenya for the geographically challenged), bright, clean and aggressively complex. The grading process in Tanzania is also the same as in Kenya, where it is graded on bean size, and AA is the largest, followed by A and B down the line. In the United States a very popular Tanzanian coffee is the peaberry variety. Why? Well, a couple of theories about that one. Peaberries seem to have a mystique about them. What's a peaberry? It's when a single bean develops inside the coffee cherry, instead of the familiar two "flat beans". Why so many fans of the peaberry? The theory is that all the goodness of the coffee cherry is in only one bean. Another reason for the popularity of Tanzanian peaberries is simply a factor of supply. The Japanese buy the bulk of Tanzania coffee flatberries (regular coffee beans) and since the peaberries have been sorted out, a market was needed for the peaberries. Since peaberries have the cult following mentioned above, Viola! Exotic Tanzania Peaberries! Hence, with the exotic name (Tanzania Coffee) and the peaberry factor, we cup and cup to find those Tanzanians that truly deserve the praise, and are not just a function of the hype! 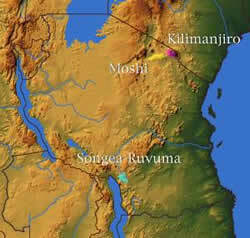 Growing Regions: Mount Kilimanjaro, Hight Plateaus between Lake Nyassa and Tanjanyika.